Staff Selection Commission (SSC) has declared the result of Paper-II. 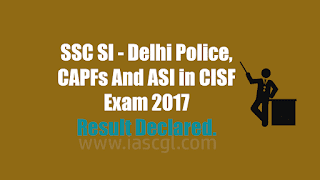 Staff Selection Commission(SSC) has declared result of SSC SI In Delhi Police, CAPFs And ASI in CISF examination 2017. Candidate male/female appeared in the examination can check their result at official website of SSC, a direct link of result is given in this article. According to SSC, schedule of medical examination of recruitment process for SI in Delhi Police, CAPFs and ASI in CISF will be intimated to the candidates in due course. Candidates are advised to follow the websites of Regional Offices of the Commission regarding issue of Admission Certificate for Medical Examination.